Anthony Cerra and Russ Hakimiyan are the tag team that make up JoyStickers LLC. They came to Inventables online hardware store about six months ago with an idea to make a joystick for the iPad. They had played some games and experienced some frustration that the device didn't have a button you could press. After all, shooting a machine gun is kind of hard to do on a touch screen. They started by creating some CAD drawings for what the device could look like, and then they started sourcing materials. They had to solve several sourcing and engineering problems including finding conductive rubber or foam materials, how to stick the button to the iPad, and how to package the whole device together. They found a few materials and vendors through Inventables, ordered some samples, and ran some tests. After a little bit of iteration they came up with a prototype that worked! Last week they came to our office and showed us their prototypes. 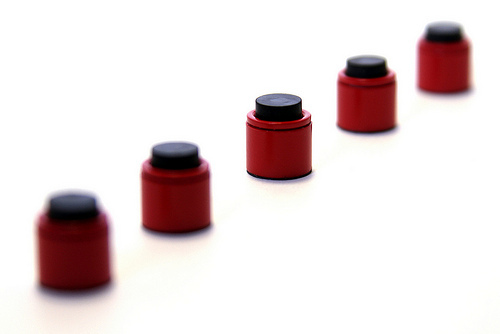 The prototype has a simple red barrel and a squishy black button. The button is conductive so that when it hits the iPad screen it can detect that it's been pushed. Today they've launched on Kickstarter! They are looking to raise $25,000 to help them buy the tooling and materials they need to build the product. Watch their video, and if you like the product, sign up to back it. Your concepts are good & I like your video.It was interesting to read about the process. I appreciate that you let us know about the bumps in the road.